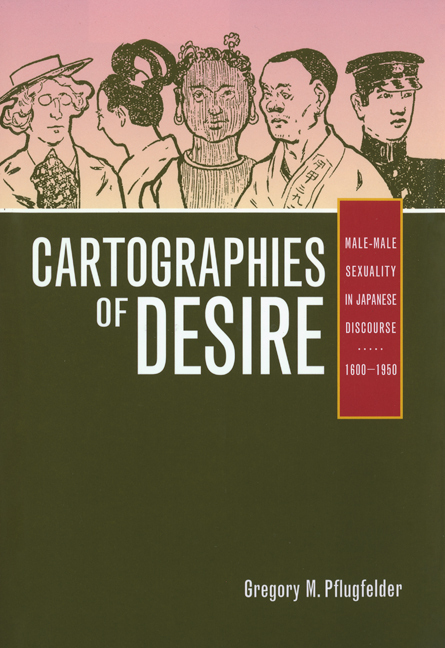 In this sweeping study of the mapping and remapping of male-male sexuality over four centuries of Japanese history, Gregory Pflugfelder explores the languages of medicine, law, and popular culture from the seventeenth century through the American Occupation. Pflugfelder opens with fascinating speculations about how an Edo translator might grapple with a twentieth-century text on homosexuality, then turns to law, literature, newspaper articles, medical tracts, and other sources to discover Japanese attitudes toward sexuality over the centuries. During each of three major eras, he argues, one field dominated discourse on male-male sexual relations: popular culture in the Edo period (1600-1868), jurisprudence in the Meiji period (1868-1912), and medicine in the twentieth century. This multidisciplinary and theoretically engaged analysis will interest not only students and scholars of Japan but also readers of gay studies, literary studies, gender studies, and cultural studies. Gregory M. Pflugfelder is Assistant Professor of Japanese History at Columbia University, and author of Seiji to daidokoro (Politics of the kitchen) (1986).